That’s a question I was asked when I worked for…erm…not sure. It was when I was in the corporate world, as part of a training session about branding. We were asked to write our reply on a Post-It note and stick it on the wall. When we compared notes (ha ha! ), some people had answered with their boss’s name. Some gave the name of the department. Some wrote the name of the company. Others put the name of the parent company. The trainers were amazed. They’d never experienced such an identity crisis within an organisation before*. What do you write when you fill in a form and are asked the country where you live? For me, it could be England, Britain, Great Britain (GB) or United Kingdom (UK)**. Perhaps the country has an identity crisis too. And that thought reminded me of a conversation I had when I lived in a flat in a shared house. It was about the time when British passports were being replaced by European ones. My neighbours didn’t want a European passport. I was joking, but I’m not sure they ‘got it’. Whether at country level or company level, branding is important. Is your brand identity clear? What would your employees say if they were asked who they work for? 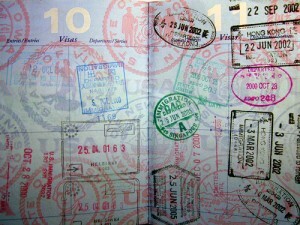 Would they be proud to carry your company ‘passport’? Will your brand get you where you want to go? *At the time, I worked in the Catalogue Department of Freemans Home Shopping which was then owned by the Sears Group. Previously, it had been independent. Briefly, it was owned by Philip Green. Eventually, it was owned by Otto Versand in Germany. No wonder there was confusion! **Of course this might change depending on the result of the upcoming Scottish independence referendum. Dangerously addicted to your phone?